When builders began working with Glass Reinforced Plastic (GRP) as a material, they were well aware that they were building something to last. What has transpired is that many of those yachts have been around for so many decades that heir designs have in fact become 'classic'. The Corinthian Classic Yacht Regatta continues to encourage and welcome Classic GRP (Classic Plastic) boats designed to the CCA rule - or are at least 40 years old - to participate. 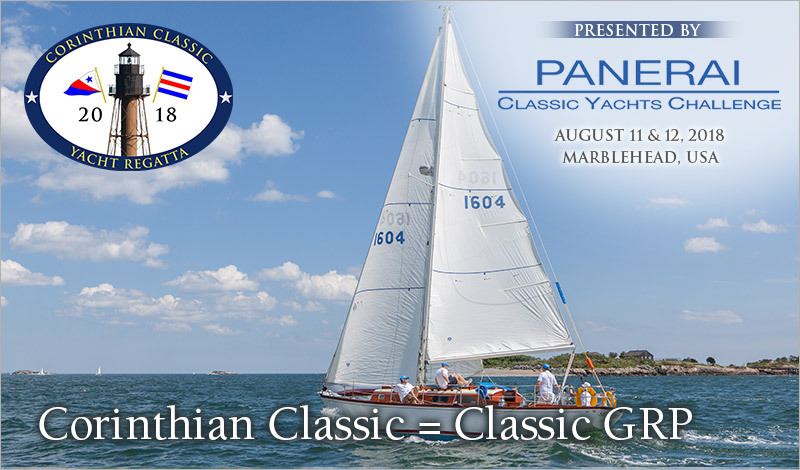 The Corinthian Yacht Club of Marblehead, MA is proud to announce the 2018 Corinthian Classic Yacht Regatta presented by Officine Panerai, the title sponsor of the Panerai Classic Yacht Challenge Circuit that takes place in the Mediterranean, Marblehead, Nantucket and Newport. This year's Corinthian Classic will be held August 11th & 12th. This is an event you don't want to skip. Start planning now and tell a few friends – we don't know whom we've missed. The racing will be 'low key' but it is an excellent opportunity to stretch your sea legs, put your beautiful boat on display, and mingle with those who share your passion.